Shahid and Sonam Kapoor are hitting pedal to the mettle to accelerate the promotions of their upcoming Mausam which is fast nearing its September 16 release. In a unique one of a kind and first of its kind promotional strategy, the lead actor and actress of a film have taken on the onus and personal responsibility of promoting the film on their own two or should we say four shoulders. 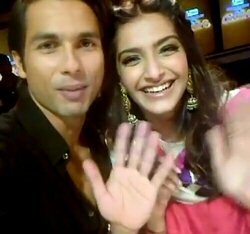 Later the same day, Sonam went onto post a video on Youtube of herself and Shahid on sets of the popular reality music show, Sa Re Ga Ma Pa L'il Champs 2011. The brainchild of film’s heroine Sonam Kapoor - the video diaries are certainly a creative way for viewers to have an aankhon dekha haal of all the Mausam promo-ing action. Promotional runs are set to continue with a celebration for the success of Mausam’s music planned for today where singers from the film's soundtrack like Rahat Fateh Ali Khan, Tochi Raina, Hard Kaur and including Director Pankaj Kapoor will perform live.